Part of the show Phosphorus: Essential to All Life But Are We Running Out? Bob - I hope you haven't been here too long? Graihagh - I have but I've been enjoying the sunshine. I didn't realise how long it would take to cycle. That's Dr Robert Evans from Anglia Ruskin's University and, despite his tremendous cold, he still let me pick his brains about phosphorus. Robert - Oh phosphorus. P, phosphite. It's an element that most plants need to grow. It's part of proteins, it's part of your body, it's part of plants. Most soils in Europe, and I think probably worldwide, are short of phosphite so it's a key ingredient for plant growth. So if you want to improve yields, you've got to put these kind of things on. Graihagh - I've read all sorts of weird sources of phosphate. Things like blood and bones and all sorts of things. Robert - Yes, that's right. When phosphate fertilizers were first devised, it was mainly using rock phosphate and then when we had the phosphate nodules here, the dinosaur poo, it was obviously much cheaper doing it here. Graihagh - What was this dinosaur poo? How was it formed? Robert - Cambridge Greensand was forming over about 100 million years ago and, whether it's really dinosaur poo or whether it just looks like dinosaur poo, I think there's quite a bit of argument about that. Now then, we are literally about there. That's Coton, the village there. Graihagh - These instead of ordnance survey's they're like geology surveys? Robert - The geology maps and these, in places, are almost identical but the geology maps we're looking at the rock depth. We were looking at it in the top 1.2 - 1.5 metres. So, if you look on here, Cambridge Greensand is literally in Cambridge - that's it. 92a. Graihagh - This is sort of a light blue colour we're looking at and you're right, it is a very thin stretch that goes from sort of Southwest Cambridge all way through North/Northeast Cambridge. But, what I notice is, all of Cambridge urban area is also in this light blue colour. Robert - That's because it's urban. Nine on this map means disturbed ground so it's a very similar colour to urban. Robert - It is actually. There's probably quite a lot of it. In places it was really widely excavated and there's quite a lot of - I think the outskirts of Cambridge was excavated for the coprolite diggings. Robert - You have to get down on your hands and knees to read it. It's not very spectacular but I was absolutely gobsmacked when I saw it. Graihagh - Gobsmacked because this sign represents a significant part of history - The East Anglian Goldrush. So coprolite is the commercial name for phosphatic nodules which were formed in the rock under your feet, deposited around 110 million years ago. 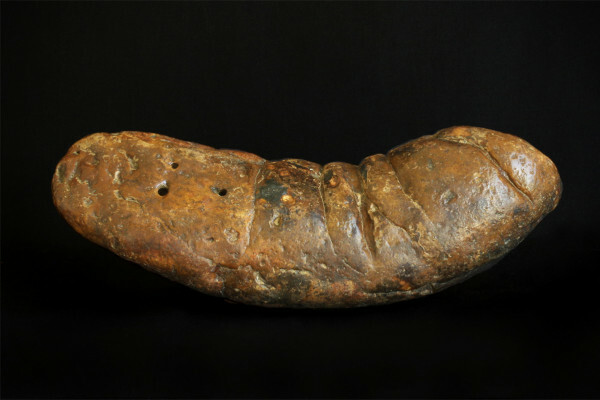 When experiments showed locally mined coprolite could be turned into fertilizer much more cheaply than imported bone meal, the great coprolite rush of the 1850s was on. And there's a picture as well actually of the diggings near Orwell and Barrington. Robert - The industry grew and landowners, and tenants, and agricultural workers alike could make money from the new industry. It's just amazing how quickly the labour market expanded. Graihagh - Something like Barrington, it said before the coprolite industry there was no-one living there. During the industry there was 155 and then afterwards there were 3. So, actually, Barrington was born because of coprolite? Robert - Yes. It says in the peak, 1877, Cambridgeshire produced almost all of the 54,000 tons of raw phosphate used for manufacture in Britain. So, in actual fact, we were self-sufficient in fertilizer. That was absolutely gobsmacking! Graihagh - Given today that we're not self-sufficient at all. Robert - In practically anything! The industry waned in the 1880s as cheaper phosphate was imported from North America and today, most of the coprolite diggings like this one are filled in and the land returned to agricultural use. Graihagh - Does that mean we can be self-sufficient again? Robert - No - it's all been dug out. Graihagh - All of it? Robert - Well it's something like 40 out of thousands of acres that's left. So there's probably no more coprolite diggings to be done. Previous Mercury's May Transit: Why do we care?